Scott Harrington, known to play by play announcers as "the guy the Maple Leafs got for Phil Kessel", was re-assigned to the Toronto Marlies today. The Leafs were forced to call-up Marlies co-starter Garret Sparks due to a persisting injury to James Reimer, and as such, needed to clear someone from their 23-man roster. Scott Harrington has performed well in a limited role so far for the Maple Leafs. Having opportunities to play with Toronto's top young D men, Jake Gardiner and Morgan Rielly, he was an effective defenseman. He has the potential to be a top 4 piece for Toronto's future. Recently, though, being saddled with Roman Polak's ineffective defensive game has hindered Harrington's ability significantly. Here is a visual from Micah Blake McCurdy's website www.hockeyviz.com, showing an overview of Harrington's season. A quick rundown of what this is saying. The top graph is Harrington's ice time share. Each player is a different coloured bar, and the larger the bar is the more time Harrington spent with that player. You can see very clear pairings from that graph for each game. 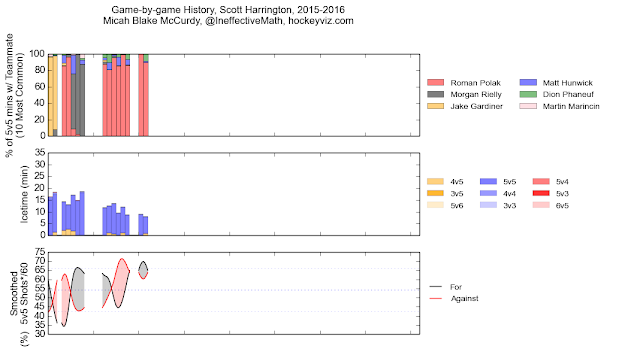 The second graph isn't super important to my point, but it shows Harrington's ice time situations. Each situation is a different coloured bar, and size is relative to time as before. As with most players, most of his time has been even strength. The bottom graph is where the point is made: this is Harrington's results for each game are shown. This graph displays Corsi For per 60 and Corsi Against Per 60 in separate lines on the graph. The higher the black line and the lower the red line, the better. It's clear to see when you compare the graphs, Harrington's lines flip from the good way to the bad way when he was paired with Polak. This one is a pretty simple explanation: Waivers. Scott Harrington is the only player on the current Leafs roster who is not subject to waivers. Recently, the Leafs lost Petter Granberg on waivers, and they gained Frank Corrado on waivers near the beginning of the season. They are a large part of the hockey business. There's a guide to waivers linked in the sidebar for anyone who isn't aware of the many rules that apply to waivers. All that matters, though, in this case, is that Harrington was the only player who could go to the AHL team without risking being taken away on waivers. There is an additional bright side in this situation that makes this the right call, and that's the fact that Harrington being out means Marincin, who has been equally good in an equally small role, gets to play. He is also playing with Polak, but since Polak will be a trade asset this season, he won't be healthy scratched very often. This was, essentially one of two moves the Leafs could have made. The only other would be waiving the recently claimed Corrado to allow him to go to the Marlies, or another NHL club, and actually get to play hockey. Sending Harrington down, from the Leafs' perspective, is an obviously preferable alternative. Harrington will almost assuredly be back up with the NHL club once Reimer is healthy and Sparks can be sent back down to the AHL. Until then, enjoy some Martin Marincin hockey.